According to the physical and chemical properties of veterinary drug, our company specially researched and developed ZPS58-11 Veterinary Drug Tablet Press. ZPS58-11 Veterinary Drug Tablet Press has high stability and high output. It is very popular with veterinary manufacturers around the world. ZPS58-11 Veterinary Drug Tablet Press is a basic equipment suitable for mass production of veterinary bolus. The structure of ZPS58-11 Veterinary Drug Tablet Press is double-pressure, with two sets of feeding devices and two sets of wheels. 11 sets of punch can be installed on the turntable, and 22 pieces can be pressed through one rotation. The speed of the turntable, the filling depth of materials and the thickness of tablets can be adjusted. The mechanical buffer device of ZPS50-11B Tablet Press can avoid the damage caused by overload. ZPS58-11 Veterinary Drug Tablet Press is suitable for pressing granular raw materials into round, blocky, spherical and annular tablets. But ZPS58-11 Veterinary Drug Tablet Press is not suitable for pressing semisolid, wet particles, hygroscopic & low-melting-point materials and powder. ZPS58-11 Veterinary Drug Tablet Press conforms with the requirements of GMP. The drill drift and drift pin is a combined type. If you want to change the specification, you just need to order required drift pins. 1. ZPS58-11 Veterinary Drug Tablet Press is single-press tablet press equipped with 11-set moulds. The moulds are installed on the working table (also called turntable). The punch pole make up and down movement along the curve track. Pressing process is completed by up and down pinch rollers. 2. The technological process for pressing of ZPS58-11 Veterinary Drug Tablet Press is continuously material feeding, filling and pressing. 3. 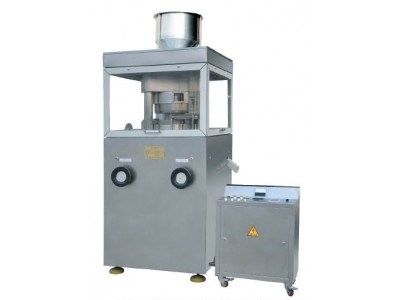 ZPS58-11 Veterinary Drug Tablet Press is motor-driven. The turntable rotates clockwise through a triangle belt transmission reducer. 4. The pinch rollers adopt rolling friction. ZPS58-11 Veterinary Drug Tablet Press's working pressure can be adjusted within the allowed range according to the practical requirements. 5. The tablet-pressing room is made of organic glass and it can prevent the bug dust contamination during the process of tabletting. 6. Thickness of tablets and working pressure can be adjusted by indicated direction of the hand wheel. 7. The motor is controlled by frequency converter. The rotation speed can be adjusted within an allowable range according to practical production. 8. In order to keep the electric elements clean and reliable, the electric system is separated from the main unit.